The Dank Crystal is my company, but it’s about so much more than me. It’s been built by friends sharing their skills, love, and kindness. Here’s what I’ve learned from collaborating with my community to make something awesome! My day job is in music. The number one question I get asked from people at dinner parties is: “How does a band get signed to a record label?” My response is always the same: start local and expand from there. If you’ve planted roots in your town, people will take notice. Play shows, send music to your local radio station and weeklies, those are the easy ones. What’s most important is to build a place for yourself in a scene, and to support your scene. If the music is good, you’ll get noticed. I’ve used this exact same model of marketing for my own brand. It started two years ago. My friend Zach Bolton is the owner of Close By Shop by day, and by night I traded him the use of my HBO Go login for an introductory lesson in candle making. At first, I made candles and gifted them to friends, which soon turned into selling them to friends. Then it rolled into asking friends and local Seattle shop owners, like Laurie from Ghost Gallery, if they’d carry my candles. I forged relationships with stores directly and began building a stockist list - including the Sub Pop Records store at Sea-Tac airport. Start by building a relationship with one shop. You can always expand from there later. If there’s a particular store you love, ask if they’re open to carrying your goods. Consignment is a great way to start with low risk to the shop owner. But a quick word of warning: Unless a store is on top of their books, it can be tricky to keep track of funds. Beyond that, don’t be afraid to reach out to non-traditional vendors. I’ve had yoga studios and record stores carry my candles. I’ve even traded goods for store credit. I’ve found that self-promotion is only as weird as you make it. When I first started, I’d always talk about my company in a sarcastic tone. I didn’t realize until recently how much that undermined the quality of my product. I’d say things like, “Oh yeah, I just listen to music and make weird things.” The reality was that I was proud of myself for building something from the ground up. I just wasn’t sure how to appropriately talk about my product without sounding like I was bragging or pushing something that people didn’t want. With time I’ve been able to ease into the role - my love for my product helps - and now I’m able to market and promote myself without feeling uncomfortable. It’s important that your brand has an identity and a voice. I’m an extremely sarcastic person who relies on humor for everything. I’ve found a way to organically weave this into everything that I do, from the names of my candles to the text in my Big Cartel shop. It’s important to me that my messaging depicts a cohesive identity. I want my consumers to feel like they’re traveling with me and sharing my life experiences. That’s why, when I travel for work (which I do a fair amount) or go on vacation or to a show, I share it all on social media. I want my customers to get a sense of who I am as a person. There are only so many photos I can post of the candle making process and my products, so I try to mix in photos of bands, records, travel, friends, food, and other products that I enjoy. I give my followers a sneak peek into who I am as a person, helping cement a brand identity. Here’s a not-so-secret secret. Ever wonder why famous people get free things all the time? It’s not just because brands want that famous person to wear their product (of course they do) - it’s also because brands want to associate themselves with the other brands those famous people are endorsing, which hopefully follows with a high return. If Beyoncé is wearing it, you probably want to as well, and there’s no shame in that. But small companies don’t and shouldn’t spend their funds on sponsorships or marketing campaigns, so what should you do? Reach out to fellow makers and offer a trade. (Channel The Beatles by repeating: “I get by with a little help from my friends.”) In my case, the only way I survive is with the help of my friends. I’m forever in awe of the amount of talented group of artists, musicians, and all-around awesome people I have in my life. As I mentioned earlier, Zach Bolton (also owner of of Porchlight Coffee and Records) has played a huge part in creating and inspiring my brand. So has my boyfriend Bailey Flynn. I honestly can’t tell you how many times I’ve needed a design and both Zach and Bailey deliver awe-inspiring work without any hesitation. My best friend Carly Starr took the amazing product shots for my site. 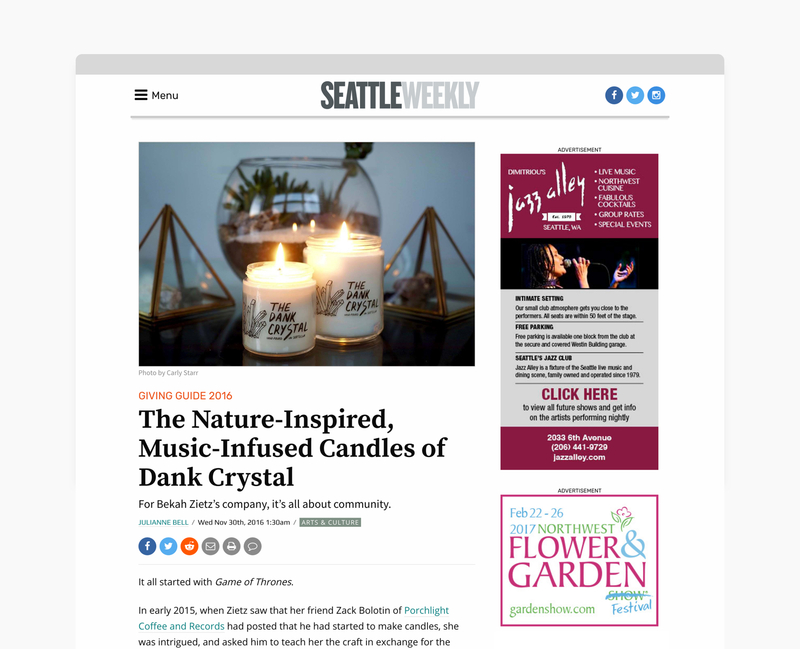 The Dank Crystal was recently featured in an article in The Seattle Weekly, and Carly was equally excited to see her photo and credit in the story. 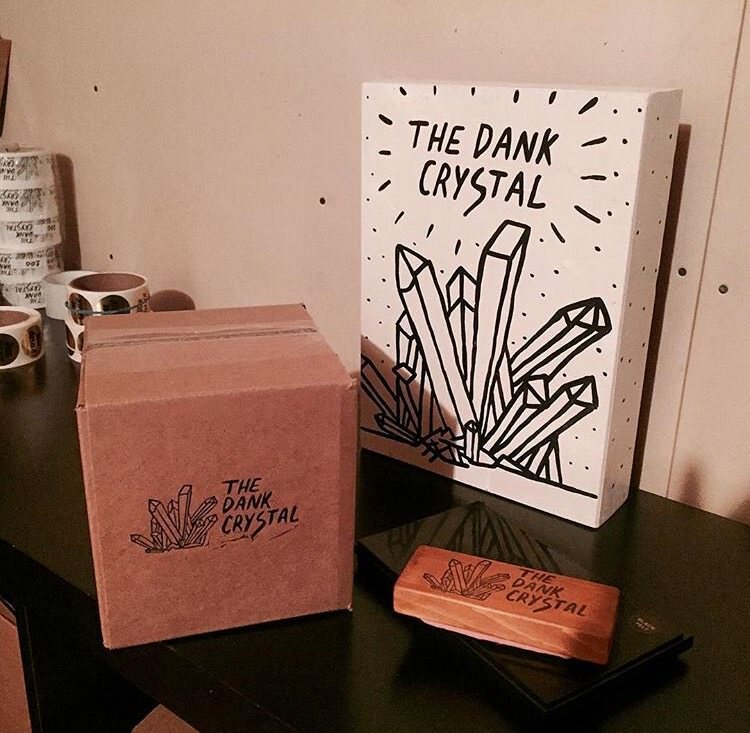 Another friend, Morgan Haas, is an amazing painter and I commissioned her to design a Dank Crystal logo greeting card. A new product in my shop and the perfect reason to work with more friends! What more could I ask for? Ashley Armitage is an extremely talented photographer whose pieces promote body-positive imagery, self-love, and love of the female form. She also happens to be a big supporter of The Dank Crystal. We’ve traded candles for photos, and The Dank Crystal even got a mention when she and her boyfriend Derek Erdman were featured on Apartment Therapy. I’ve also sent emails and candles to companies that I like and want to support. Fan mail goes a long way toward building relationships. Through a customer I was led to a stamp-maker named Kelsey Pike. By trading, I now have a custom logo stamp that I use to stamp cards and boxes. Though Kelsey and I have never met, we’ve bonded through our wares. Don’t be afraid to let your customers sell your product for you. I love to repost photos that people have taken of my candles, and I encourage them to email me all the time. It’s a small thing, but it connects you with your consumer better than repeating the same marketing message over and over. Lastly, remember that even your detractors can become your supporters, so don’t get discouraged by negative feedback. No one likes to be told what’s wrong with their product, but if you’re open to constructive criticism, you’ll make stronger connections with people and improve your work. If someone takes the time to give you feedback, it means that something in your work spoke to them. In all facets of my life, I believe you’re only as strong as your community. I’m lucky to have found a way to weave my professional life with my maker life, and I remember that every day. If you’re looking to grow your company through the power of barter and don’t know where to begin, you can always start with me.